Brand & Co was a major branded food producer in Britain. Brand’s Essence of Chicken remains a major health supplement in Asia, and Brand’s A1 is one of the highest-selling English-style brown sauces in the world. How did this company become almost entirely forgotten in its native Britain? Henderson William Brand (1805 – 1893) was born in Durham, North East England, the son of Thomas Brand, an innkeeper and brewer. The young Henderson Brand almost certainly worked in his father’s kitchen, where the quality of his fare became quickly evident. Henderson Brand was employed in the kitchen of the Prince Regent (1762 – 1830) as “under cook” from 1817 to 1821. Brand had an excellent opportunity to develop his culinary repertoire in one of the greatest kitchens in Europe. The Prince Regent was a confirmed gastronome who had previously employed Marie-Antoine Careme (1784 – 1833), the founder of modern haute cuisine, and one of the greatest chefs of his era. The Prince Regent became King George IV from 1820. Brand was promoted to “Yeoman of the Mouth”, a position akin to that of sous chef, from 1822. Brand was appointed head chef to Thomas William Coke, 1st Earl of Leicester (1754 – 1842) from 1826. Coke was a charismatic man, and regularly held large dinner parties to discuss his agricultural improvements. His magnificently-equipped kitchen at Holkham Hall in Norfolk boasted a fireplace large enough to roast an ox. Brand published an updated version of Simpson’s Cookery, a popular cookbook, in 1834. Brand established a factory/shop on 11 Little Stanhope Street in Mayfair, London from 1835. 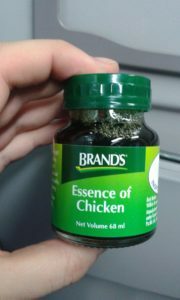 His first product was Essence of Chicken, from a recipe he had allegedly developed for the convalescent king. It was manufactured by heating chopped meat inside a pot until it separated into fat, fibre and “liquid essence”, a clear amber liquid. It was recommended as a substitute for brandy in relieving exhaustion and nervous ailments. Shortly afterwards, Brand introduced Essence of Beef at the request of a Dr Druitt. Evidently a better chef than a businessman, Brand was declared bankrupt in 1843 and the company was acquired by a Mr Withall. Henderson Brand re-emerged on his own, trading as “H.W. Brand” from 1858. He was appointed Cook and Co-Manager of the Cuisine at the 1862 International Exhibition in London. It was at the Exhibition that he first introduced “Brand’s International Sauce”. At the Exhibition it was ranked “A1”, and thus became known by this name. 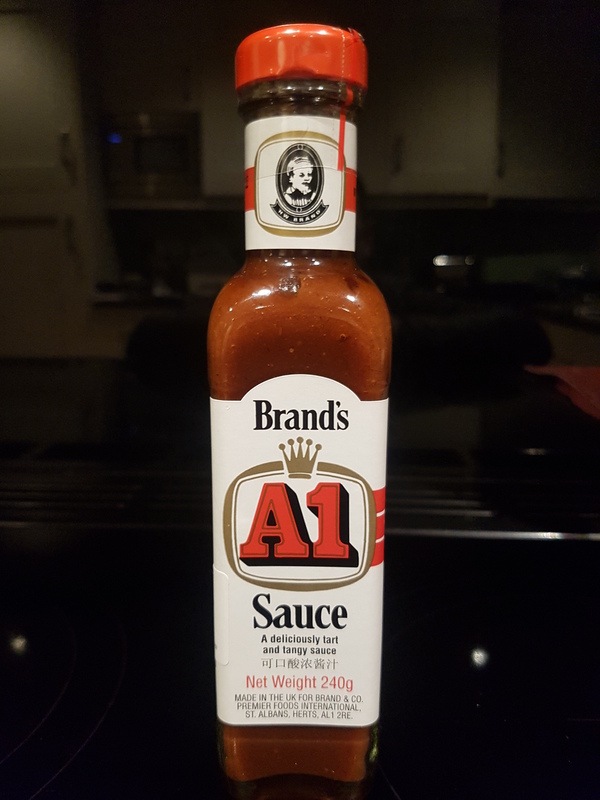 A1 sauce was in use by the Royal household by 1868, and it was in use at the House of Lords and the House of Commons by 1879. H.W. Brand had been acquired by Brand & Co by 1886. Withall sold Brand & Co to Thomas Dence (1840 – 1918) for £5,000 in 1873. Dence was born in London to a Kentish grocer. Dence was joined in partnership by John James Mason (1833 – 1896), who managed the business. The Mayfair site proved too small for the expanding business, and a new factory was opened at South Lambeth, Vauxhall in 1887. Brand & Co products received royal warrants from Edward VII, George VI, the Tsarina of Russia and the Empress of Germany. Henderson William Brand died in 1893, a sadly forgotten figure, who warranted no newspaper obituaries. Sales of A1 were such that Brand & Co struggled to meet demand, and so the firm never actively sought out export markets. Gilbert Heublein (1849 – 1937), a German-born spirits distributor resident in Connecticut, visited England and encountered A1 sauce. He was impressed, and after much effort he acquired the exclusive US distribution rights to A1 sauce from 1894. A Heublein advertisement claimed that A1 held over 50 percent of the British bottled sauce market in 1895. It was described as a milder version of Worcestershire sauce. Brand & Co had 200 employees, about 80 of which were women, by 1906. Facilities for the staff were excellent, with a canteen, a smoking room and a club room. The firm processed about six tons of meat every day. Brand & Co was established as a private limited company to acquire the business from the partnership in 1907. The company continued to be managed by the children, and later grandchildren, of Mason and Dence. Brand & Co struggled to meet increasing consumer demand, and Heublein established their own A1 sauce factory in Connecticut from 1916. Thomas Dence died in 1918, with an estate valued at over £916,000. Brand’s Essence remained the best known product in 1923. Brand & Co used no artificial preservatives. A1 sauce contained vinegar, Eastern spices, and dried fruits including raisins, sultanas, dates, oranges and tomatoes. Brand & Co became a public company from 1949. By this time Brand & Co employed 650 people, and the site in Vauxhall occupied 2.5 acres and 123,000 square feet of factory and office space. Net assets, excluding goodwill, amounted to £452,000. Brand’s Essence and A1 Sauce remained the principal products. 26 percent of production was exported. Brand & Co was acquired by Cerebos for £4.1 million in 1959. Cerebos owned well-known packaged food brands such as Bisto, Paxo, Scott’s Porage Oats and Saxa salt. Sales of Brand’s Essence of Chicken had been successfully established in Asia by 1961. The British A1 sauce bottle label indicated that it contained “aromatic herbs from Old World gardens, rare spices from the Far East and sun-ripened fruits from the orchards of the world”. Manufacture of A1 sauce began in South Africa from 1963, and was already underway in Canada. All British Brand & Co production was relocated to the Cerebos plant in Greatham, County Durham from 1967. The Greatham site had ample space for expansion, and sales of Brand’s high quality tinned soups were growing. The Vauxhall factory was closed, and its sale netted Cerebos a windfall of £900,000. Cerebos was acquired by Rank Hovis McDougall (RHM) for £61 million in 1968. That same year, Brand & Co won a Queen’s Award for Industry for export achievement. 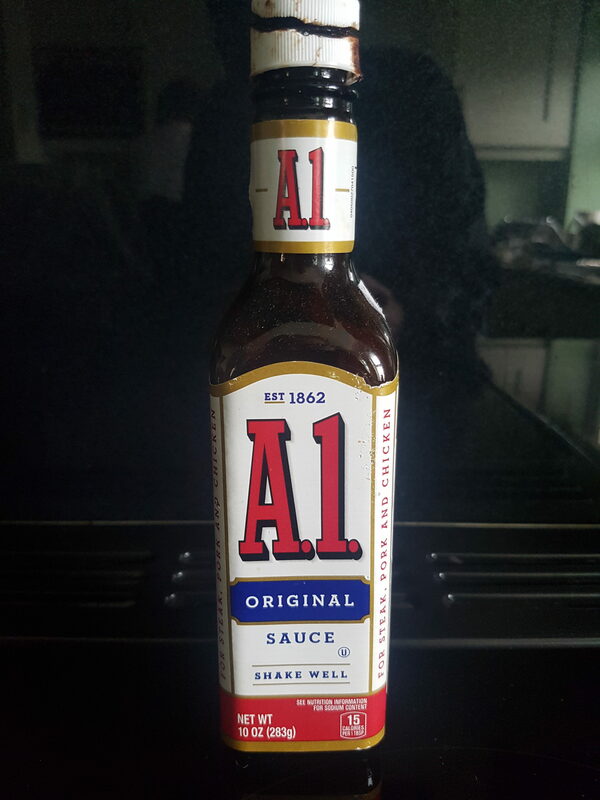 A1 Sauce sales were discontinued in Britain sometime between the late 1970s and the early 1980s, displaced by later rivals such as HP, Daddies and OK sauce. As of 2018, Brand’s Essence of Chicken has annual sales of around £330 million in Asia, where it is valued for its restorative properties. A1 sauce remains popular in the US and Canada. Premier Foods, the successor to RHM, still manufacture A1 sauce in England for export to Asian and European markets. English-made A1 sauce contains tomatoes, malt vinegar, spirit vinegar, sugar, dates, salt, locust bean gum (a thickener), ginger, caramel colour, onion powder, nutmeg, black pepper and cayenne pepper. American-made A1 sauce contains tomato puree, spirit vinegar, corn syrup, raisin paste, crushed orange puree, mixed spices, garlic powder, caramel colour, onion powder, potassium sorbate (a preservative), xanthum gum (a thickener) and celery seeds. Hi Michael do you have a photo?